Bolts on each cylinder cap allow internal access from either end of the cylinder. Easy-to-access external grease fitting on rotary coupling. Dry O-ring sealed cylinder caps for clean assembly and disassembly. Lift points integrated directly into the Dynamic Rotary Cylinder. Variant Mining Technologies’ innovative Vibratory Feeders are designed to transport and redirect muck in underground circuits. Built to the highest engineering standards, they can be incorporated into your existing systems or coupled with Variant Mining Technologies’ industry-leading chutes.Each Vibratory Feeder is custom-built to meet our customers’ individual requirements. Our Feeders are completely cageable and specifically designed for easy installation. They can be pneumatically or hydraulically driven, according to your needs. Variant Mining Technologies Vibratory Feeders are designed to withstand the most extreme conditions. With wearpoints reinforced with 400BHN or 500BHN hardened steel liners, our Vibratory Feeders are built to last. 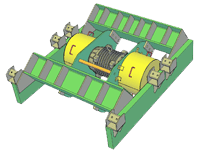 Variant Mining Technologies Vibratory Feeders feature a Dynamic Rotary Cylinder, a pneumatically controlled adjustable counterweight. Milled from a solid block of T6061 high-strength aluminum and lined with 1/4” nitro tubing, the Dynamic Rotary Cylinder is extremely durable and light. With a maximum feed rate at 0 psi, the Dynamic Rotary Cylinder is not only reliable—it is also energy efficient.